A buddha bowl is a bowl of plant-based nourishment. It is often based on a grain, and my favourite is a mix of brown rice and barley. Then topped up with as many variety of plant goodness as you can manage. 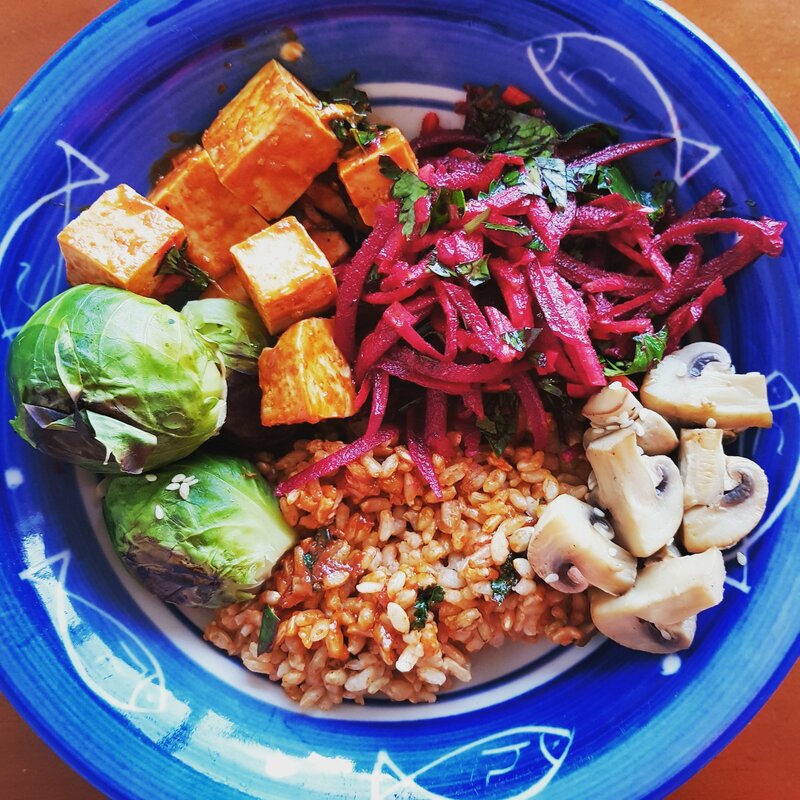 Featured in this buddha bowl are seared brussel sprouts, chilli tofu, beetroot salad and sesame mushrooms. In the next few posts, I will include simple creations where you can assemble into your own buddha bowl. I find it helpful to make a batch of each item and combine them into a bowl creation each day as part of my batch cooking strategy. Makes plant-based eating fun, varied and delicious! It is often misunderstood that if an individual does not eat animal protein, that one is vegan. I’m here to clarify the differences between a whole food plant based versus a vegan diet. A whole food plant based diet excludes any animal protein. However, the term “whole food” means including only very minimally processed or non-processed foods. So whilst BBQ Shapes and Oreos does not have any animal derived products, they are typically not part of the whole food plant based diet. Veganism is a philosophy and way of living. Vegans seek to exclude as far as is possible and practicable, all forms of exploitation of and cruelty to animals. This includes not eating any animal products, but also not wearing any clothing derived from animals (e.g., leather, wool) or using products that involves testing on animals. You may find BBQ Shapes and Oreos part of a vegan diet as they are devoid of animal protein. However, they will not wear wool or leather, and will choose to use beauty products that does not contain beeswax and has not been tested on animals. An individual on a whole food plant based diet will be concerned about a minimally processed diet devoid of animal protein. Beyond diet, they may not be concerned about other aspects in which animals have been used.